This powerful space is meant for deep feeling, healing, and calming in the festive festival atmosphere. Our purpose with the Herb Labyrinth is to share the path experience and allow participants to surround themselves in the green environment where Liz, an organic farmer, spends most of her time. 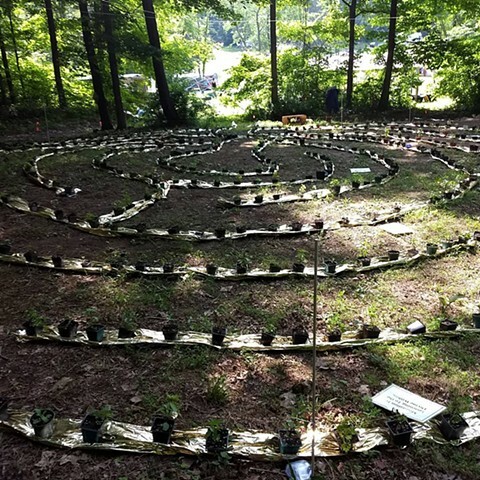 At the end of the event, those who feel drawn to any of the over 500 herbs will be allowed to take them home, to keep a piece of the festival and the Labyrinth with them as they return to the journey of their own lives. A labyrinth is an ancient symbol that relates to wholeness, combining the imagery of the circle and the spiral into a meandering but purposeful path. It is outlined with a raised rope of light, illuminating the path on a 24-hour basis and guiding all onto the purposeful path of the Labyrinth.